This piece will offer why this stunning referendum would be so politically powerful and – despite that – so difficult to persuade Democrats to adopt. Deeply heartened by Sunrise’s refusal to be taken lightly, I see clear hope that the movement is willing to get radical and use “nuclear” political weapons against the adamantine anti-climate obstinacy of the Democratic leadership. As a veteran activist strategist, I have one such “can’t miss” weapon to propose: making the 2020 election a referendum between Democrats’ Green New Deal and Republicans’ racist, classist climate genocide. If taken up by a popular presidential hopeful like Bernie Sanders—or by a climate-obsessed one like Washington governor Jay Inslee—this stark referendum could sound the well-deserved death knell for today’s beyond-criminal Republican Party. And spell endless, politically suicidal woe for any corporate Democrat who dares oppose it. Making the 2020 election a referendum between the party of a wildly popular Green New Deal and the party of racist, classist climate genocide ought to be an easier win for Democrats than the proverbial shooting of fish in a barrel. And far less messy. Yet, astonishingly, forcing today’s deeply corrupt “Nummy Bits” Democrats (see next section) to embrace that referendum will probably require unprecedented levels of heroic movement activism. And probably the combined efforts of the Sunrise Movement and the Poor People’s Campaign—both with a serious stake in making this referendum happen. The remainder of this piece will explore why this stunning referendum would be so politically powerful and—despite that—so difficult to persuade Democrats to adopt. Presumably, seeing how “doggedly” one dog in ten embraced the lethal alternative, Nummy Bits weren’t all that “nummy.” And, given that Democrats insist—as doggedly and perhaps as suicidally—on promoting themselves as merely being “better than Trump,” the clear implication is that Democrats themselves aren’t terribly “nummy.” Especially when, finding the discussion of serious, real-world issues embarrassing, Democrats fail to point out how atrocious—how utterly “un-nummy”—an alternative Trump actually is. Like, say, one bent not merely on climate genocide, but racist, classist climate genocide. As in, say, the totally preventable deaths of tens, perhaps hundreds of millions of our planet’s poor people of color. So racist and classist are the looming genocide’s effects that I considered demanding Trump’s impeachment over it a fitting task for the current revival of Martin Luther King’s Poor People’s Campaign. The Poor People’s Campaign clearly had other priorities, but perhaps—since race and class figure so prominently in the impending climate genocide—it could add urgently needed muscle to the Sunrise Movement’s pioneering political efforts to stave off that worst-ever crime against humanity. More on potential synergy between these important current movements later. Finally, they include a Democratic Party rendered so namby-pamby by its own corruption—by its criminal unwillingness to discuss any policy questions, no matter how urgent for humanity, no matter how damning for Republicans, that might upset its wealthy donors—that its namby-pamby self-branding merits comparison with “Nummy Bits.” Except that Democrats’ self-branding is far worse. See, at least the fictitious “Nummy Bits” ad people were willing to give the alternative a properly horrifying name: starvation. Also—and what made the Nummy Bits kamikaze “ad campaign” fun—is that there were presumably lots of other competing dog foods out there willing to trumpet tastier merits than being “better than starvation.” In a two-party system where Republicans truly are the only (electable) alternative, Democrats—being namby-pamby to the max—dare not point out that Republicans really are the electoral equivalent of starvation. Nor do they claim any tastier merit for themselves than “not being Trump”—whose gargantuan horror Democrats (in their donor-censored refusal to discuss humanity’s life-or-death issues) refuse even to properly articulate. For now, I’ll lay down this law for Green New Deal movement activists: No Democrat (listen up, Liz Warren) who refuses to discuss the genocidal horror of Republican climate policies can be trusted as a serious, committed supporter of the Green New Deal. I’ll devote the rest of this essay to explaining why. Unspeakably loathsome is a tame description for today’s Republican Party—for its politicians, billionaire supporters, and supporting media, if not necessarily for its voting base. Granted, with Democrats—pretty loathsome in their own right—as the only viable alternative, Trump’s voting base can be cut a certain amount of slack for getting things so horribly wrong. Especially when the presidential-candidate face of the Democratic Party was such a corrupt, elitist, self-righteous (and possibly criminal) hypocrite as Hillary Clinton—she of the screaming “basket of deplorables” contempt for working-class voters. Besides the smarmy loathsomeness of Clinton—Dolores Umbridge of the Harry Potter novels, just as ready to take “umbrage,” is fiction’s best comparison—Trump supporters merit some (though not unlimited) slack based on the general misinforming loathsomeness of consolidated corporate U.S. news media. Based on objective evidence, it seems totally fair to say—as Edward Herman and Noam Chomsky brilliantly asserted before today’s extreme media consolidation—that U.S. news (whether corporate Democrat or corporate Republican in its bias) is a concerted propaganda attempt to conceal how our political system works from U.S. voters. Above all, how its policies are designed to benefit corporate and plutocratic interests to the extent that the common good—of either our nation or humanity itself—is not even a remote political consideration. So unflinching is Republicans’ anti-Christian racism and social Darwinist contempt for the poor that it includes a blithe willingness to make poor people of color—perhaps by the hundreds of millions!—victims of climate genocide. Since poor people of color are being hit first and worst by the accelerating climate crisis—and since Republicans are criminally ramping up that crisis—it follows that most of the initial unnecessary deaths caused by Republican policies will be racist, social Darwinist ones. Attentive readers will note my change (from early in this essay) from citing Republicans’ “classist” to citing their “social Darwinist” climate genocide. While I earlier said classist for brevity’s sake, social Darwinist (in addition to racist) is much closer to the rhetoric promoters of a 2020 “Green New Deal vs. climate genocide” referendum should actually adopt. As a deeper (deeply deserved) twist of the knife, it rightly accuses Republicans (supposedly vehement “Christian” opponents of Darwinism) of the crudest, most unscientific, most anti-Christian version of Darwinism imaginable: a ruthless, immoral “survival of the fittest” that targets for suffering and death the poor outcasts Jesus himself most loved. Democrats, mostly contemptuous of religion themselves, have foolishly granted Republicans the fig leaf of Christianity—while today’s Republicans are the worst persecutors of Christ imaginable. So why are Democrats so opposed to this perfectly stark 2020 referendum? Because the Democratic Party leadership is much more interested in milking rich donors and keeping its power than mopping the electoral floor with Republicans, no matter how dangerous. In fact, the Dem leadership, far from wishing to eliminate crazy, dangerous, morally reprehensible Republicans, like to keep them around—and keep them as crazy, dangerous, and morally reprehensible as possible. That way, they can, as a “Nummy Bits” better-than-starvation party, extort our votes based on Republican craziness without engaging in the mildest reform of their own corrupt party. And certainly not the extensive reform required by a Green New Deal. Democrats avoid the obvious, damning—and winning—accusation of Republican racist, social Darwinist climate genocide because it would 1) raise embarrassing questions about their own climate and other policies and 2) so weaken Republicans as an extortionist threat that Democrats would be forced to appeal to voters based on actual populist policies. Like, say, a wildly popular Green New Deal. All of which, in a nutshell, is why only Democrats willing to openly denounce Republicans’ racist, social Darwinist climate genocide can be trusted as supporters of a Green New Deal. From the analysis just completed, it should be obvious that Republicans—as a racist, social Darwinist science-denying party hell-bent on the reckless expansion of fossil fuels—are criminal perpetrators of racist, social Darwinist climate genocide. And should obviously suffer the electoral devastation that status merits. What’s obvious to the U.S. voting public depends on media repetition, and given the virtual conspiracy between Republican-friendly media and Democrat-friendly media not to cite it, the plain fact of Republicans’ racist, social Darwinist climate genocide is far from obvious to the U.S. voting public. Which in turn sabotages the voting public’s sense of climate crisis urgency and its pressure for the only just, viable solution to that crisis: a Green New Deal. 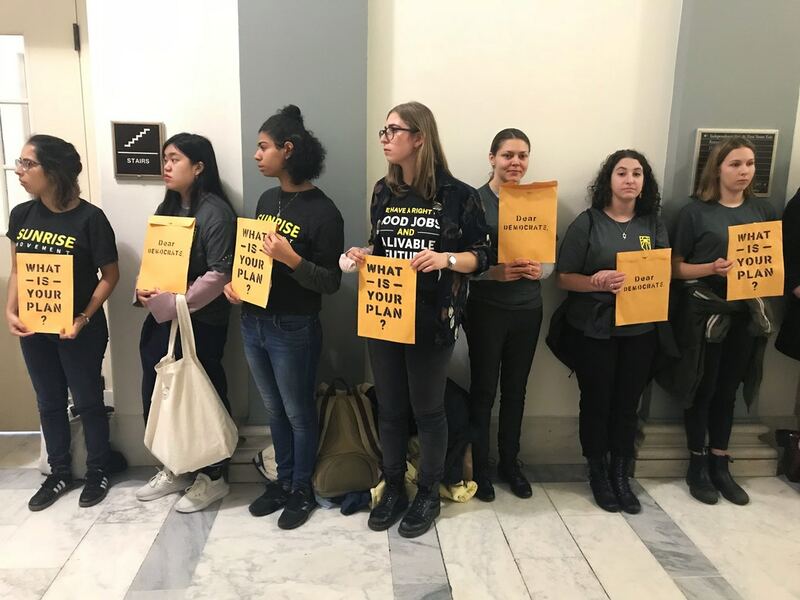 The Sunrise Movement and their avid Congressional supporter, surprisingly genuine maverick freshman Alexandria Ocasio-Cortez, have expressed ardent advocacy for a Green New Deal. I haven’t heard anything from the Poor People’s Campaign specifically about a Green New Deal, but it seems a natural for them—as is a compelling interest in warding off racist, social Darwinist climate genocide. So, as potent newsmaking forces with aligned interests, all three need to heroically play the role of Captain Obvious and repeatedly denounce Republicans’ racist, social Darwinist climate genocide for what it obviously is. Doing so will make the 2020 election a referendum between the party of the Green New Deal and the party of racist, social Darwinist climate genocide. And warn Democrats not supportive of the Green New Deal that the label of “genocide Democrats” may soon await them.